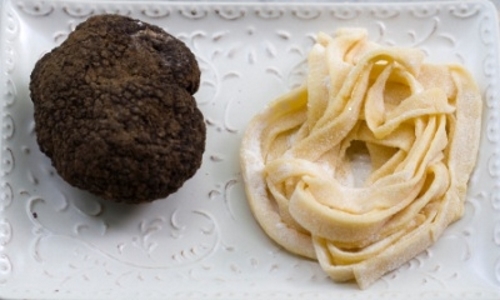 There is nothing more elegant and impressive than cooking with truffles and inviting friends over to enjoy a truly unique dinner. On occasion a few high end Italian restaurants like Spiaggia in Chicago host elaborate truffle dinners which I still haven’t had the opportunity to attend. So if your cooking at home like me, here are a few recipes for you and your family to enjoy. Sweat the onions and garlic in truffle oil and 2 tablespoons of butter over medium heat until they start to soften, do not brown. Stir the rice, chicken, onions and garlic together for a couple of minutes to toast the rice a little bit to add a nutty flavor to the dish. Do not add any liquid to the rice yet. Bring the liquid to a boil then reduce the liquid to a simmer over low heat. You will need to stir the rice constantly to prevent any burning on the bottom and to develop the starch, or texture of the dish. Add more broth one cup at a time until the rice is cooked to your desired doneness and all the broth is absorbed. Remove the risotto from the heat and stir in the parmesan cheese and the remaining butter. Plate and finish with the chopped parsley. In a large saucepan sauté the onions and garlic in the olive oil and butter until tender, about 2 minutes. Add the mushrooms and sauté another 5 minutes. Deglaze the pan with the wine and broth. In 6 quarts of boiling salted water cook the fettuccine until al dente. Drain the pasta and toss in the mushroom sauce. Plate and shave the white truffles on top. Drizzle with truffle oil and serve with the Parmesan cheese. In a large skillet cook the filets in the butter and oil for 3 minutes on each side. Deglaze the pan with the wine and beef broth scraping the brown bits off the bottom. Add the cream for 2 more minutes and spoon over the steaks. 1 pound of russet potatoes, peeled, diced and cooked. Mash together the potatoes, butter, cream, salt and pepper.